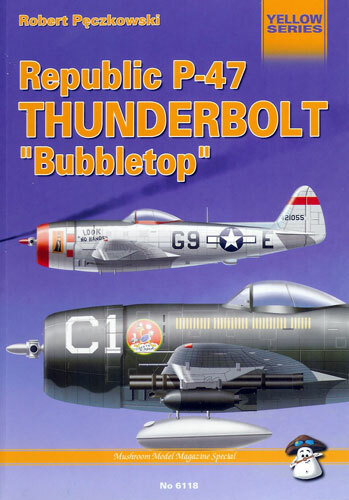 This new publication from Mushroom Models Publications, 'Republic P-47 Thunderbolt Bubbletop', is in the compact B5 format and contains 128 pages packed with detail. The quality of paper, photographs and printing is excellent. The book covers almost the complete technical history of the late production bubbletop canopy P-47. A brief description of variants from the P-47D-25RE through to the final P-47N is included. The publication contains many photographs with the majority being printed in colour. There are some very in detail walk around photographs of many preserved aircraft. These will be of great benefit to the super detailers as there are some very close photographs of the undercarriage, undercarriage bays, engine and cockpit. Many detailed 1/72 scale line drawings are included and even the weapons and drop tanks are included in these drawings. 35 colour side profiles displaying different schemes worn by various nationalities. The nationalities include USAAF, RAF, Brazil, Chile, Columbia, Cuba, Dominican Republic, Ecuador, France, Iran, Mexico, Nicaragua, Peru, Portugal, Taiwan, Turkey, USSR, Venezuela and Yugoslavia. Overall this is a very concise and complete reference for any modeler wanting to build late model bubble top P47 Thunderbolt.